OK, so I’d been reading a photography magazine as we approached Lake Cullulleraine at the end of a long day on the road, and I was itching to try a few things out. So what if my camera was ‘only’ a point & click, and not one of the fancy-schmancy-hi-tech must-have gadget-laden-gizmos the mag condescended about. Besides, I was in a BAAAAAAD mood. We SO hadn’t planned for a four-day dash 2000 km (that’s a LOTTA miles) across the country for home only a few short weeks after we’d left. We also hadn’t planned on the camper trailer’s broken spring. Or the hiking boot loss-of-sole emergency. Or the killer storm that sprung us a leak AND turned our campsite into a make-shift mud-wrestling arena. Nor had we planned on an escalating family misfortune, sucking us into its cruel maw and grinding us down with despondency. No, this road-trip was doomed. Nothing for it, but to cut our holiday short! So now we were three LOOOOOOONG and dismal days on the road UP with – please goddess – one more day and a few hundred more kilometres DOWN ’til home. Dropping like a post-poor-policy-announcement pre-election poll, the temperature plunged into single figures as we headed south into the cold and dreary gloom of the winter we’d almost escaped. The one cold-climate outfit I’d brought was getting an unexpected airing. Every day. And we’d passed the last bakery before the border. Life sure wasn’t proving to be all RED Rocks and Rainbows on this dismal downunder day. So in the late afternoon, after 3 days and ~1600 kilometres on the road, we pulled into Lake Cullulleraine exactly 5 weeks to the day since our first visit*. ‘Let’s try the other caravan park this time,’ Pilchard suggested in the interests of equality. Too tired to argue, we turned off the highway towards the lake’s edge where a couple of other vans – a good sign – were already set up, with no barking dogs, blaring radios or blithering idiots apparent. No obvious axe murderers or aliens either*. Actually, NO ONE AT ALL!!! Had the secret rapture come early to this small lakeside settlement?? The sign at the entrance advised us to select a site, set up and the managers would track us down later. And so did the park resident who emerged from the cottage near the office to show us the ropes. Finding a level, drive-through site with a bit of space between us and the nearest campers wasn’t too difficult. So we pulled into a spot with plenty of space between us and our nearest neighbours, set up the camper trailer and headed for the lake to watch the sunset, pausing only to purchase a packet of chocolate biscuits – essential, given the circumstances – from the roadhouse and general store. The lingering cloud under which we’d driven for several hundred kilometres throughout the day was breaking up as the sun sank through it towards the lake. Strategically placed trees, reeds – and even birds – silhouetted themselves photogenically against its glow. I started playing with my camera settings. Maybe that magazine was worth the bucks I’d paid for it after all! As the sun sank slowly over the lake, the glow in the sky intensified and the reflections turned into an awesome colour palette beyond my wildest dreams through the viewfinder, my shutter button finger was in serious danger of developing a bad case of Repetitive Strain Injury. And if the friendly local who wandered over for a chat as the sun sank lower hadn’t been an artist and photographer with expertise in Photoshop as proven by what he showed me on his i-phone, I probably would have shown him my snaps. The (thankfully much later) southern dawn brought a whole new set of photographic fantasies despite the low-single-digit overnight temperatures, firmly placing Lake Cullulleraine into the ‘favourite place’ category. 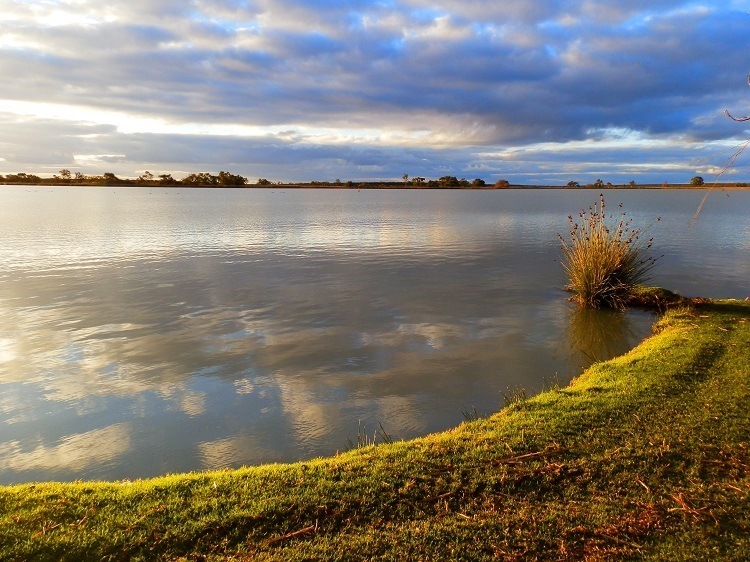 Our short stay at the Lake Cullulleraine Holiday Park was worth every cent of the $25 I put into the honesty box with my business card just before we left – only moments before the manager appeared! And so we set off for the South Australian border – and home. With a clutch of (in my opinion) killer photos that had miraculously lifted my despondency and despair. I’d found an antidote to the dark side of our Australian travel adventure. My camera sings to me. When I could actually understand the photographic code and lingo peppered throughout its articles, I learned a lot from the photography magazine. But the artful and inexplicably ever-so-slightly-tilted lake horizon was mine. Want a Lake Cullulleraine adventure all of your own?? Of course you do! But live too far away?? No problem – with Travel Associates the world can be yours! Lake Cullulleraine: so COOL it’s HOT! The 3-Car, 2-Beach, One Fine Day! It is like that when we can keep changing the settings. Thank you, Indrani! Sometimes the scene, my mood and the photos all come together – this was one of those times! @Go Camping Australia – The scene (and photos!) were an unexpected bonus at nearly the end of a challenging trip. And I don’t even know how to use my point & click to its full potential!! @ladyfi – Thank you! The second trip to this spot gave me even better pisx than the first!! Wow wow wow – how spectacular! So beautiful… sigh. Sorry you have been having some issues at home. But the photos are beautifully rich in colours, so well worth the trip. I have a fancy SLR, and I really don’t know how to use it to its full potential…a bit hit and miss with some of my photos! @FruitCake – Some years were just not meant to be … which I’m sure you can relate to! @Gregory Urbano – Hey, I’M not worried!! It’s just the pitying looks I get when I ‘fess up to *only* having a point & shoot! @Colin – It was my pleasure to be there & take them for you! @Mo – You mean the sunset? Or the photos??!! Both real – and that’s how they came out of my camera! @TMWH – Thank you! And that’s why I haven’t posted anything since … just CAN’T find anything to top them!!! @PDP – Thanx once again, my friend! Your praise means EVERYTHING!!!! Will be over to pay you a visit any minute! @Iris – HAhaha, it SO owed me some killer shots!! Luckily, you don’t have to choose a favourite!!! @Sharon – You know you’re an amateur when the ‘before’ and ‘after’ shots in the tutorials don’t look that different!!! @Chris – I just couldn’t help myself with the magpie!! It didn’t fit in with the rest of the pix – but I couldn’t leave it out, right?!?!?! @Filip – You already shoot great shots, my friend! I was just in the right place at the right time!! @Liz – You’re right about everything! My problems faded away to almost nothing when faced with the grandeur of that vista! @Ramakant Pradhan – I sure felt much better after watching the scene. AND taking the pix – I couldn’t wait to test them out on my readers! And you ALL seem to like them! @Beach Bum – You’re WAY too kind, my friend!! @MJWC – And that, my friend, is why there are so many pix! I couldn’t narrow it down any further!!! @Jo-Anne – Hahaha, don’t accuse ME of actually knowing what I’m doing!!!! But I’ll take your compliment just the same! Thank you!! @Loredana – Maybe the dark side brings out the best in me! @MastHoliday – Funny you should say ‘magic’ – that’s one of my camera’s effects!! @diane b – Oh, I don’t know WHAT I’d do if my camera became defective!! I have NO technical knowledge whatsoever!!! When things are bad, they can only get worse … but thanx for your kind words, as always! @Geoff & Hels – As you can see, it’s SO worth stopping over!! 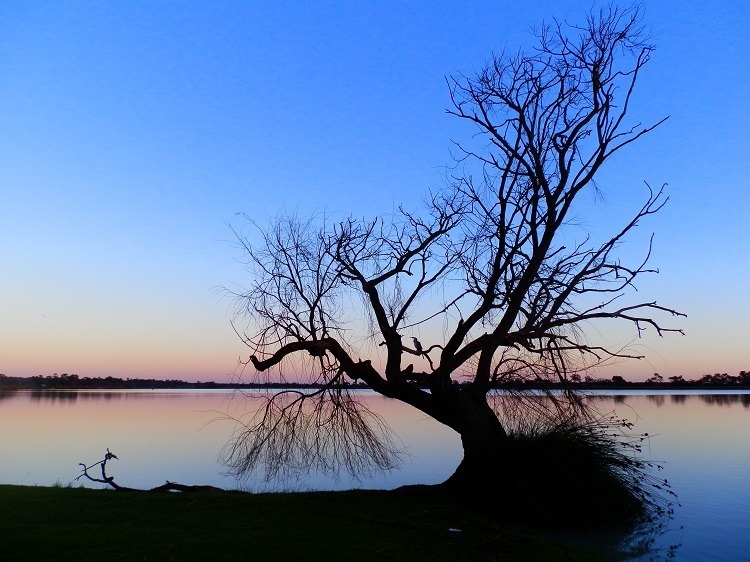 Poor old Mildura won’t get a look-in now with shots like THESE on offer! @Diane AZ – I’ve always been a sunset girl … so was AMAZED at the gorgeousness of the sunrise! @Steffi – Sometimes the simplest sunset is the most spectacular sky! @Joop – Those warm colours are what living in Australia’s all about, my friend! Thank you for following! @Karen – Thank you!! I’m still in the best possible mood when I see the shots – even down the track a few weeks later! @Fun60 – Haha, it’s SOOOOOO easy downunder! So many marvellous scenes, many of which I couldn’t take a bad pic of if I tried! @Sallie – I actually think the bad parts of the trip enhanced my appreciation of the good! But the chocolate biscuits I ate after didn’t hurt either … fingers crossed for good luck for both of us! @whiteangel – Yes, some trips are doomed. But if everything goes bad on this trip, that’s all our bad luck used up for awhile, right??? Those are some outstanding sunset shots! Simply gorgeous. I had a chuckle at your description of the photography magazine’s codes and lingo. I’ve been taking photos with fancy cameras all my life and I still look at those magazines and wonder what exactly it is they are trying to tell me. Amazing pics, Red! Guess that trip just owned you such a sunset after so much trouble! Really awesome pics, can´t decide for a favorite! You prove my theory that its the person taking the shots and not the camera that make spectacular images every time Red..totally awesome images, and I hardly ever say awesome 🙂 Hope all is well at home, I have something that I hope will cheer yo up tomorrow. I am sorry that you’ve had some hard times! But these are some of your very best photographs. Such brilliant color and intense composition! Simply gorgeous. no need to worry about your camera gear with gorgeous shots like those, great colors! Sincerely hope things are on the mend at home! I was going to say the picture of the Lake Cullulleraine Sunset is stunning… but then I looked at the rest and I would never be able to pick which one I like best. Beautiful!! Adored all your grizzles and grumbles in this post. Such a fun read. And I love my point and shoot. We make music together. We understand one another. And clearly so does yours. Adore the colours and scenes round the lake in these photos. Absolutely stunning. Nothing like the “as is” photos. Lake Cullulleraine seems to have wonderful sunsets with colours aplenty as well as serene dawns. Beautiful clicks! I absolutely loved reading your narrative as much as I loved your images! I find that photography lifts my spirits like nothing else. To view the beauty of nature and to capture it as a wonderful reminder is second to none!! Amazing views and colors, especially love the pink clouds reflected in the lake at sunrise! WHOA!!! Make no apologies for a ‘point-n-shoot’. They are just as good as the fancy DSLRs with the right person operating the camera. Any writer who puts them down is a jerk– proof is that you have generated an eye-popping set of images. Great eye — congratulations. As usual beautiful pictures and great writing! Wow, what the Spectacular shots! the reflection looking glorious.. Such great captures your magical eyes… thanks for sharing. These pictures are all just perfect. I would already be happy to shoot one like that. Oh my! One gasp after another as I scrolled down!! Not bad for a “point and shoot”. Not bad at all! Now, which to choose for a calendar? Moon at sunrise is my favourite but the shots are all breathtaking and I’m glad that you have made them a big size. Sorry to hear things have been difficult and your trip cut short with a long drive home. Hope all is improving. I haven’t been in that area by road, I must correct that soon. Nothing like a good shot to cheer you up. I’m having the opposite lately with a camera that gets the sulks now and then and my enthusiasm and ability is on a slippery slide down hill at the moment. Oh what beautiful photos taken by someone who knows what they are doing, there is no way I could get a photo like that so I love looking at all these photos….. Wonderful sunsets, you did well. You certainly had several thing go wrong, that does happen sometimes when we travel….take care. Views like that would certainly lift my mood. We have had trips that started out like that….I hope neither of us ever has it happen again. You don’t need a better camera….the pictures couldn’t be any better. Thanks for taking me along on the trip (which I loved except like I said for the first part and that happens to everybody I expect sometimes). Your magazine helped you take those shots. Wow! I think you do yourself a disservice you take the most amazing shots. Very beautiful photos and post for SWF!Simple fantastic!!! These are just awesome. I would think your mood changed when you saw these! I have always thougt, it’s not so much the camera that you use, if you have “the eye”, you can take great photos, which you surely have done! Great views and lovely photo’s with warm colors….. excellent pictures. Sounds like a challenging trip, but your pictures are SPECTACULAR! @Carole – HAha, so those camera tips worked then!!! ‘Normal’ is just a state of mind … but I sure hope we get back to it soon! @Eileen – It’s surprising what a difference taking a few killer photos can make to one’s spirits!! Who’d have thought?!?! @River – Life goes on, and we shall get on with it!! At least reading the mag gave me the confidence to play with the settings – to good effect, if the comments are anything to go by! @Joan – You would do well to visit it … although there is no Royal Hotel! @Saucy – Yeah … I’m a fair weather traveller, aka ‘coward’!! The storm thing scares me, but we’ve survived quite a few – I just don’t really write about them because I’m SO not out there taking pix!! And I’ve never done ‘cute’ in my life!!! @Rajesh – Thank you! It was a privilege to photograph them!! @Andrew – Funny, I nearly didn’t put the 2nd pic in – wasn’t quite sure if it fitted with the others. But I (egotistically) liked it so much myself … Thanx for your kind thoughts – getting back to normal slowly! @Kusum – It was even better seeing it for real! @Arija – Oh, now I have an odd mental image (the chin/navel thing). Pilchard & I are often reminded of how little it takes for wonderful to turn to woeful. But Lake C is a low commitment weekend, right?? @Linda – The challenges of the trip make the sunset’s beauty all the more fabulous!! @ladyfi – It was worth it all for praise like that from you!!! Red… As always, a great read (had me giggling)and the photos are stunning. Where can I purchase a camera like yours? or at least give me the name of the magazine. Stunning views with grand reflections. LOVE the spectacular sunset shots!! I’ve not bothered to work out the settings on my camera, by the time I did that it would be pitch black outside and I couldn’t photograph anything. I leave it set on auto. I can’t make sense of the magazines. Hope everything is okay at home? These are all WOW shots. Seeing these beautiful scenes and sunsets would pick up my spirits also. The colors in the sky and reflection are AMAZING! Beautiful post, have a happy weekend! Sorry to hear about your trip and its disasters! But WOW WOW WOW – your photos are stunning and definitely worthy of being in a magazine! Hard to write with my chin on my navel. Jaw droppingly magical shots. I bet the place would be all muddy water and wet feet for me. I sincerely hope that the family emergency works out in the best possible way for everyone. I guess you an now understand, with all the technical and health issues of this trip, why I feel a little intimidated, at my age and health, to launch into great adventures on my own. That would be a several months of a calendar filled. Somehow, I like the less obvious second photo the best. The light is wonderful. I hope things are on the improve at home. The colours are so vivid. Bold and beautiful shots. Get Email Updates HERE – YOU choose when and how! Follow RedzAustralia on Social Media! Want MORE RedzAustralia Blog Posts? Click HERE for a list of all my Blog Posts! My Book: Aussie Loos with Views! Red Nomad OZ is Marion Halliday, Australian author, travel blogger and traveller. Her definitive guide to downunder dunnies "Aussie Loos with Views" is an OZ travel classic; and her blog Australia by Red Nomad OZ is an insiders' guide to the BEST natural attractions and holiday destinations in Australia!